Ideally suited for precision machining of large diameter workpieces such as brake drums and rotors, hubs and gears. 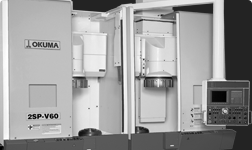 The open architecture, PC-based Okuma THINC-OSP control operates two independent spindles for greater flexibility that improves productivity. 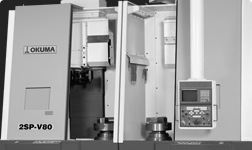 These twin-spindle, 4-axis lathes have an extremely rigid vertical, box-shaped column that allows deep cuts at high RPM. Additionally, wide, square shaped saddle and cross slideways ensure high precision during all cutting operations. Available options include live tooling on one or both sides, and with straddle tooling that enables simultaneous machining of both sides of brake rotors. 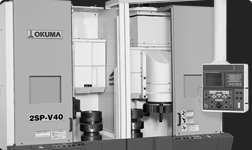 Flexible and efficient twin spindle, 4-axis vertical lathe. Rigid and powerful twin spindle 4-axis vertical lathe. Precise, multitasking twin spindle 4-axis vertical lathe.